HVG CEO Bruce Rayment has signed up for the TourXOz 2017. The charity bike ride to be held in September 2017 will take 80 riders, 30 support crew and 15 vehicles from Perth to Broome raising money for the Black Dog Institute. The ride will take 8 days to cover the 2,500kms with riders spending 6 hours a day riding a specified 150kms, and the additional distance covered by coaches and vehicles moving the caravan around the perimeter of Australia. 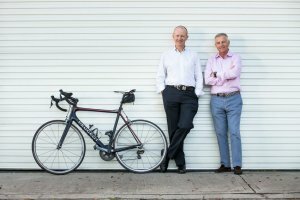 TourXOz has raised in excess of $500,000 for Black Dog Institute over the previous 2 rides and aims to raise an additional $500,000 in 2017. “I am passionate about decreasing the number of suicides that occur in this country each year, and improving the lives of people affected by mental illness. By participating in this ride and raising funds, I am assisting the Institute do more to create a mentally healthier world.” said Bruce. Bruce is a regular road cyclist, often seen early mornings on the roads of southern Sydney during the week when business commitments allow, and on weekends. The Black Dog Institute is a not-for-profit organisation and world leader in the diagnosis, treatment and prevention of mood disorders such as depression and bipolar disorder. It is a charity close to the heart of HVG with business owner Ron Ferster being a Board Member of the Institute and the Chairman of the Black Dog Institute Foundation. “I am fully supportive of Bruce, his fund raising efforts, and this ride. Mental health is an increasing problem in Australia affecting at least 20% of the population. The Black Dog Institute, through its commitment to excellence in generating evidence-based research, remains at the forefront of identifying solutions and badly needed assistance to those who experience mental illness, primarily in Australia, but also beyond.” said Ron. HVG is a diversified industrial products distribution business with divisions that include Alucobond Architectural, Smartstone Australia, HVG Graphics Media, HVG Fabrics and HVG Decorative Building Products. It distributes brands including Alucobond®, Smartstone®, 3M®, Revolution®, Visiontex®, Serge Ferrari®, Wilsonart® and Homapal® to the construction and graphics markets around Australia. If you feel this is an important cause to support you can make a donation on Bruce’s TourXOz page. With Bruce covering all of the ride costs, 100% of donations are going directly to the Black Dog Institute. You can read more about TourXOz on the website and follow Bruce’s ride in September on the HVG Facebook page. You can read more about The Black Dog Institute and the work they do on their website .